Takeaway: The hidden costs of accidents often surpass their direct costs, yet they're often overlooked. Safety professionals know that there are hefty costs to workplace accidents. An injured worker comes with all sorts of price tags, from workers' compensation and regulatory fines to hiring replacement workers. Not every cost, however, has a clear and obvious number attached to it. But that doesn't make them any less real. Looking beyond the direct costs of accidents is important. Knowing their hidden costs will allow you to better keep track of company losses as well as understand the full impact of safety incidents. Following the Industrial Revolution, assessing the costs of workplace accidents involved a simple, crude calculation. When they wanted to measure the severity of, say, a coal mining accident or a boiler explosion, employers and regulators would simply tally up the number of fatalities (for some significant examples, see Lessons from 3 of the Worst Workplace Disasters). It's an understandable approach. The loss of life really is the worst possible outcome of these events, and it's every safety professional's job to prevent fatalities. But this rough count doesn't give us a good indication of the costs of an accident. Gradually, employers began keeping a closer eye on the losses that come about by taking a lax approach to safety, especially once regulatory bodies started issuing stiff fines for safety violations. Crunching the numbers revealed that cutting corners or overworking employees isn't at all profitable when it compromises on-the-job safety. There were simply too many easily quantifiable costs, and they couldn't be ignored. If a chemical spill took place in their plant, for instance, employers could be shown that the cost in regulatory fines, workers' compensation, lost productivity, and cleanup usually added up to a lot more than what they would have paid for the equipment, training, or procedures that would have prevented the incident from happening. But even those more sophisticated calculations did not give the full picture. Workplace safety specialists now recognize two types of costs related to safety incidents. There are, of course, those direct costs that companies have been measuring for decades. But there are also hidden costs that are more challenging to quantify and, as a result, often get overlooked. Not taking them into account, however, is a mistake. In fact, recent studies have suggested that these indirect costs can be three to ten times higher than the direct ones. So what are some of these hidden costs? Decreased morale among your workforce is one of them. 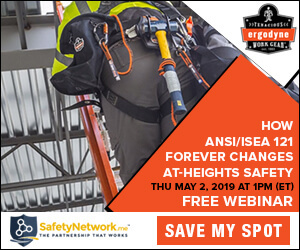 Knowing that a catastrophic incident or severe injury took place on the jobsite – or worse, witnessing it – can be unsettling. The distress is also worse for those who are friends with the injured co-worker. These psychological effects are certainly unpleasant, but they also affect job performance. Fear and anxiety can be very distracting, and they can prevent employees from being at their most productive, even if they weren't directly affected by the accident. Morale is bound to dip when an incident takes place, but the costs associated with this aren't entirely set in stone. The loss of morale is especially pronounced when employees believe that their employer hasn't responded appropriately to the situation. When the company doesn't do enough in the aftermath of an incident, workers understandably don't feel protected and are likely to worry that the incident will eventually repeat itself. By taking the right measures and showing a real commitment to safety, you can reduce losses associated with employee morale (learn more about this in Three Levels of Safety). A perception that your company is unsafe can affect your company's ability to attract and retain the best workers. If your safety record or reputation is below average, it will be difficult to secure those with the most skill and experience. No matter how attractive your benefits package is, workers will also have to weigh the possibility of suffering a serious or disabling injury if they decide to work for you. Having a spotty safety record is a great way to drive the best and brightest to your competitors. Taking an injured worker off the job following an accident often means losing some critical expertise. There is, of course, the cost of training a replacement employee. But it goes beyond that. Your employees aren't effective at their jobs because they've gone through the new employee orientation; they're effective because their experience allowed them to master their various job tasks. That loss of expertise is a cost that you cannot make up for. The best way to avoid it is to prevent your workers from getting injured in the first place (for related reading, see The Journey to Zero!). Even with the best possible workplace safety program, it won't be possible to prevent every single workplace accident. No matter what systems are in place, unexpected occurrences and human error can compromise the safety of your workers. But investing in safety can minimize the number and severity of accidents in your workplace. But if employers already know that safety incidents are costly, why should we bother trying to understand their indirect costs? Because workers will always compare the cost of taking bold steps in safety with the cost of dealing with an accident. The direct costs are enough to convince employers that safety is an important consideration. But factoring in the indirect costs shows them how much they can gain by investing in innovative, state-of-the-art safety initiatives. The hidden costs, in other words, can make safety go from being an important consideration to becoming a top priority. Calculating the direct costs of workplace accidents is straightforward: simply add up every dollar the company had to spend. But unless hidden costs are also measured – even if they're only approximate – companies will continue to make decisions based on too little information. They are likely to underestimate the value of workplace safety and opt for more short-sighted solutions. It's time to bring hidden costs out in the open. We owe it to ourselves and our workers to make the smartest decisions when it comes to safety. Zac Brough currently serves as President of SafetyWear, a division of Sullivan-Brough, Inc. Zac has over 18 years of safety distribution experience having worn nearly every hat within the SafetyWear organization. He is a second-generation owner of the family business which celebrates 40 years in 2017. SafetyWear has been a member of SMG since April, 2001 and in that time, has achieved both Gold and Peak Performer status as well as earning The President’s Choice Award. Zac has also served on various SMG distributor committees over the years.